Anna Deavere Smith, any thoughts today? I saw her perform this once in Chicago. Watching her is something like it was talking to Studs, hearings his words and the kinds of things he would rat-a-tat you with. Speaking of Anna Deavere Smith, the new Jonathan Demme film she is in, ‘Rachel Getting Married,’ is the best film I’ve seen all year. No, in more than a year. It’s an unforgettable portrait of how it might feel to be an outsider in your own family. Plus we explore the effects of guilt, and dysfunctional family dynamics, the destructiveness of feeling self-centered, and the effects on children that a cold mother (Debra Winger) can have. I was interested in the insights into how we go on when something dear missing – that seems a common feature of modern life to me. 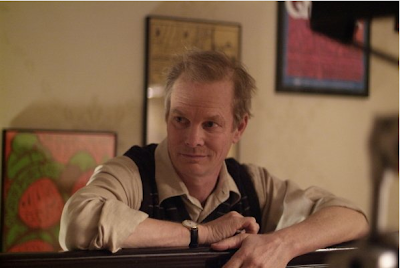 – and when he tries he botches it for his daughter Rachel (Rosemarie DeWitt) – so right, that I forgot it was Bill Irwin. The script is smart, complex and subtle – more than one major character hardly speaks, but holds a commanding presence; and the story is frank about ethnicities and race. The film is shot in a quasi-documentary style, with enough and not too much of the look of a handheld camera. The music is very moving, included an extended scene with nothing but music, from around the world (I was thinking during this of how much great music – from around the world – Studs Terkel introduced me to.) By the end it’s a great portrait of hope for a less inbred, more multi-cultural America. And now, let’s return this blog to architecture. You are currently browsing the archives for the Anne Hathaway category.